Wisconsin maps from Omnimap, a leading international map store. Beautiful plastic 3-D map of Wisconsin. Map Pins, Numbered Map Tacks, and More. Wisconsin Recreation Atlas. 1:175,000. National Geographic Maps. National Geographic's Wisconsin Recreation Atlas is an ideal recreation resource and contains accurate, detailed topographic maps with private and public land boundaries, a complete road network, valuable recreation information and extensive cross-referenced lists and charts for campgrounds, lakes, parks, attractions and more. State Game Management Unit maps and fish species lists will appeal to the sportsman while detailed primary road networks will be of great interest to motorcyclists, RVers, and those simply touring the state. Wisconsin Atlas and Gazetteer. 1:150,000. DeLorme. Excellent road atlas with topographic maps and full index. Softcover, 104 pages, 11 x 17". Wisconsin Road Map. Rand McNally. Rand McNally's Easy To Read State Folded Map is a must-have for anyone traveling in and around Wisconsin, offering unbeatable accuracy and reliability at a great price. Our trusted cartography shows all Interstate, U.S., state, and county highways, along with clearly indicated parks, points of interest, airports, county boundaries, and streets. Includes inset city maps of Appleton, Eau Claire, Green Bay, Janesville/Beloit, La Crosse, Madison, Milwaukee & Vicinity, Downtown Milwaukee, Oshkosh, Racine/Kenosha, Sheboygan, and Superior. Size is 28 x 40 inches. $5.99 63-0190 1 sheet, folded. Wisconsin road map. Universal Map. The Wisconsin State fold map is a full-color, regional map, including insets of: Appleton, Downtown Milwaukee, Green Bay, Kenosha, La Crosse, Madison, Milwaukee vicinity, Oshkosh, Racine, and Sheboygan; and features: detailed Attractions, detailed Red Areas and Trails, Interstate Exit Numbers, Latitude and Longitude information, a Mileage Chart, State Facts, and State Parks and Forests. $6.99 63-01902 1 sheet, folded. Great Lakes Travel Map. 1:1,000,000. ITMB. Using this map, one can explore Lakes Ontario and Erie as circular routes; also Huron and Superior; visit Ottawa and Toronto, Chicago and Duluth, and find Fort WilliamWawa Goose. This is a double-sided map covering from Ottawa in the north to Pittsburgh and Columbus in the south and Duluth and Thunder Bay in the west. Both Canada and the USA portions of the Great Lakes Region are included. $9.95 62-20913-GL 1 sheet, folded. $24.99 62-20913-GLW 1 sheet, flat. $34.99 62-20913-GLL 1 sheet, laminated. Wisconsin Road Map Series. GM Johnson. This three-sheet series gives complete coverage of Wisconsin. The maps include detailed road information, parks and trails, natural and wildlife areas, forests, lakes and rivers, tourist sites and services, and more. $5.95 63-01904-CE Central Wisconsin Road Map. Includes inset city maps of Appleton, Fox Cities, Eau Claire, Fond du Lac, Green Bay, La Crosse, Manitowoc, Oshkosh, Sheboygan, Stevens Point, and Wausau. $5.95 63-01904-NO Northern Wisconsin Road Map. Includes inset city maps of Superior and the Apostle Islands. $5.95 63-01904-SO Southern Wisconsin Road Map. Includes inset city maps of Janesville, Kenosha, Madison, Milwaukee, and Waukesha. Wisconsin Destination Road Map - Waterproof Map. National Geographic Maps. Printed on waterproof, tear-resistant synthetic paper, the front side is an easy-to-read road map with insets of: - Superior - Appleton - Oshkosh - Racine / Kenosha - Eau Claire - Green Bay - Milwaukee The back includes: - Maps and information for Milwaukee and Madison - Information for Apostle Islands National Lakeshore - St. Croix Scenic Riverway - Points of interest - Scenic drive - Park Service sites in Wisconsin. Size is 17¾ x 24¾ when unfolded. Sample detail from the Wisconsin road map. $7.95 63-01903 1 sheet, folded. 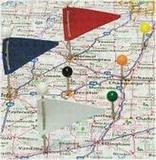 Wisconsin EasyFinder™ Road Map - Laminated Map. Rand McNally. The durable and convenient Wisconsin EasyToFold state map will take all the wear and tear your journey can dish out. The heavy-duty laminated design allows you to mark your route, make notes, then wipe the surface clean for further use. This is a must-have for navigation whether you're a state resident or just passing through. Ideal for the glove box, or car door pocket. Map size is 18 x 17 inches unfolded. $7.95 63-01901 1 sheet, folded. Wisconsin Road Map - Laminated Map. Universal Maps. The Wisconsin Laminated Map includes Insets of: Green Bay, Kenosha, Madison, Milwaukee, Racine & Sheboygan. Featuring: Interstate Exit Numbers, Mileage Chart, Parks & Rec Areas, Places of Interest & Wisconsin Facts. $9.99 63-01905 1 sheet, folded. Wisconsin City Maps. Various publishers. Folded paper street maps. $4.95 63-0192AP Appleton & Fox Cities Street Map. 1:32,000. (Rand McNally). $4.95 63-0192JB Janesville & Beloit Street Map. (Rand McNally). $4.95 63-0192K Kenosha & Racine Street Map. (Seeger). $6.99 63-0192M Milwaukee Street Map. (Rand McNally). $4.95 63-0192WC Waukesha & Waukesha County Street Map. (Universal Map). $5.99 62-6692TER Wausau Street Map. (Seeger). 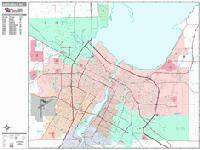 Wisconsin City Street Maps - laminated maps. Hedberg. Detail from the Univ. Wisconsin map. Front of the Univ. Wisconsin map. Reverse of the Univ. Wisconsin map. $8.99 63-01921MADI (WI) Madison, Univ. Wisconsin, and Capital Area laminated city map. A great tool in a handy format! Amazingly detailed map of the campus and capitol areas, including an inset of State Street Mall. On the back, a metro area map showing routes through and to Madison, and a map of south central Wisconsin locating towns and major area attractions. Our accordion-fold laminate titles are printed on card-stock and coated to make them more durable. They are moisture resistant, but not waterproof. $6.95 63-01921WI Wisconsin Dells laminated street map. When it comes to general planning, defining delivery areas, planning direct marketing and delivering products, our city wall maps are perfect to get the detailed information you need. These maps offer clear mapping by showing all major streets and roads, but leaving out the smaller streets. If you want a clear map for easy planning, then these are the maps for you; if you want a map showing every little back alley, these are not for you. We offer wall maps for Appleton, Eau Claire, Green Bay, Janesville, Kenosha, La Crosse, Madison, Milwaukee, Oshkosh, Racine, Sheboygan, Waukesha, and West Allis. Sample detail from the Green Bay wall map. Click here to order city wall maps and to see sample images, prices, sizes, and mounting options. Wisconsin County and State Wall Maps. We offer state and county wall maps for all of the USA. The maps come in sizes from 24 x 36 to 108 x 144 inches. They are available in variety of mounting and framing options. The maps are ideal for business applications, sales territory, delivery planning, direct mail targeting and hundreds of other applications. Click here to order county wall maps and to see sample images, prices, sizes, and mounting options. Click here to order state wall maps and to see sample images, prices, sizes, and mounting options. Wisconsin State has two long-distance trails - the North Lakes Bicycle Trail that crosses the state and the Northern Tier Cycling Trail that runs along Wisconsin's borders with Minnesota and Iowa. There are also several state and regional cycling maps available for Wisconsin. click here. We stock fishing maps for over 100 Wisconsin lakes and rivers. 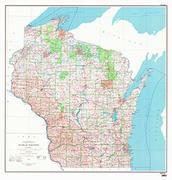 We stock all USGS topographic maps of Wisconsin at all available scales. U.S. Forest Service. We stock the Chequamegon-Nicolet National Forest map. Click here for a raised relief map of the state. Apostle Islands Hiking Map. 1:50,000. National Geographic/Trails Illustrated #235. This Trails Illustrated topographic map is the most comprehensive and complete recreational map for Wisonsin's Apostle Islands Lakeshore. The map includes valuable wilderness tips and Leave No Trace guidelines, along with updated trails, trailheads, points of interest, campgrounds, and much more. Printed on waterproof, tear-resistant material with a plastic coating for extreme durability. The map measures approximately 4 1/4" x 9 1/4" folded and 25 1/2" x 37 3/4" fully opened. Sample of the detail from the Apostle Islands map. $11.95 63-2100-235 1 sheet, folded. Devils Lake Fish Card. Franko's Maps. This fish card is a stiff, laminated plastic card, with a hole for a lanyard. Take it snorkeling or scuba diving with you! Illustrates the common fish in Devils Lake. Front of the Devils Lake map. Reverse of the Devils Lake map. Wisconsin Dells Attractions Map. Hedberg. A complete guide to Wisconsin's family fun capital! The back is detailed map locating attractions, lodging, and other points of interest in the Dells/Lake Delton area, and a downtown inset. On the front are two regional maps, highlighting the attractions within an easy drive of the Dells. The most complete map of its kind! Our accordion-fold laminate titles are printed on card-stock and coated to make them more durable. They are moisture resistant, but not waterproof. Size is 25½ x 10¼" unfolded. Sample detail of the Wisconsin Dells map. $6.95 63-01921WI 1 sheet, folded. Wisconsin State and County Wall Maps. Intelligent Direct. Click here to order county wall maps and to see sample images, descriptions, and prices. Click here to order state wall maps and to see sample images, descriptions, and prices. Wisconsin Shaded Relief Wall Map. 1:500,000. From Lake Superior in the north, past the limestone and sandstone bluffs along the Mississippi River, to Lake Geneva, most of the state of Wisconsin was carved by glaciers thousands of years ago. Elevations are represented by color, and this, in combination with our relief shading technique, gives the map a 3-dimensional look. Size is 43 x 47". $40.00 63-0151 Wisconsin. 43 x 47". Wisconsin Topographic Map. 1:500,000. USGS. Single-sided map showing the topography of Wisconsin. The map includes rivers, lakes, roads, towns, and more. This map measures 47 x 45 inches. The official topographic map of Wisconsin. $12.95 63-0150 Wisconsin topographic map, with contours. 1984. 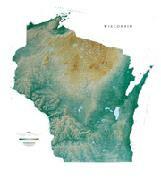 $12.95 63-01501 Wisconsin Shaded relief map. 1966. $12.95 63-01502 Wisconsin Base map. 1966. 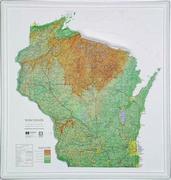 $29.99 63-0150L Wisconsin Topographic map, laminated. Milwaukee Cityscape Satellite Image Poster. Spaceshots. $30.00 67-88767 Milwaukee Cityscape poster - day. $3.95 62-1000WI Wisconsin. Size 4 x 6 in. $9.95 62-1001WI Wisconsin. Size 8 x 12 in. $39.95 62-1003WI Wisconsin. Size 2 x 3 ft.